LAHAINA, Hawaii (AP) — Gonzaga found itself in the same position as Duke’s first five opponents: appearing helpless as the Blue Devils and their rim-rattling freshmen ran past and flew over them. The Zags never panicked, never looked up in awe at the bouncy Blue Devils. They have too much experience to get rattled, even against college basketball’s most talked-about team. Playing with poise and grit down the stretch, No. 3 Gonzaga turned back top-ranked Duke’s late-game charge to win the Maui Invitational title game 89-97 on Wednesday. Rui Hachimura scored 20 points and the Zags beat a No. 1 team for the first time while ending the Blue Devils’ unbeaten streak on the Valley Isle (17-1). Dubbed a Final Four contender when Killie Tillie returns, Gonzaga already looks like one — even with one of their best players on the bench in a walking boot. Five-time Maui champion Duke (5-1) made it look easy the season’s first five games, its fantastic freshmen soaring through the spotlight, not cowering away from it while looking all but unbeatable. Taking advantage of Gonzaga big man Brandon Clarke’s fourth foul, Duke pulled within a basket as Blue Devils fans sent an earthquake of noise off the rafters of tiny Lahaina Civic Center. Gonzaga’s defense made up for it. Hachimuru and Clarke each had two blocked shots in the final minute, capped by Clarke’s swat of R.J. Barrett’s driving attempt at the buzzer. “We finally started to fight in the last 14 minutes, whereas before we had just come to play and we weren’t as emotionally ready as Gonzaga,” said Duke’s Javin DeLaurier, who had six points and six rebounds. 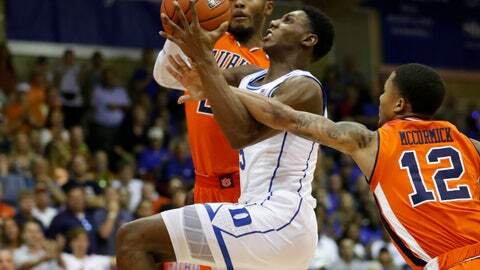 Duke and its future lottery picks steamrolled San Diego State and outlasted No. 8 Auburn to reach its sixth Maui title game in six years. Gonzaga survived Illinois’ frenetic attack and put on a second-half show to beat Arizona in the semifinals. The Zags not only didn’t back down, they threw the first punch. The Zags swatted Duke’s bid away.